Looks about and hops; occasionally thrusts arm forward. Submerge, becoming unattackable for 2 rounds. During this time, the Sons of the Root attack the opponent, dealing 98 Elemental damage each round. This little guy is great in S/S. He'll heal underground with Nature's Ward + Sons of the Root, and in general the latter can be utilized as a tactical dodge. Otherwise, Fist of the Forest hits hard and Lash does considerable damage, even more than a P/P Club would do so long as it hits three times every so often. The Nightshade Sproutling is probably better in S/S for PvP, and the Sun Sproutling is a better P/P choice. The 3 pure breeds (HH,PP,SS) have max health 1725, max power 325, max speed 325 respectively. Health restoration is a function of Power ... the more power, the more health is restored (Leech Seed or Natures Ward). The S/S will go first in most battles but deals less damage and has less health. The P/P Fist of the Forest will hit for 690 against anyone except a critter, and it hits for 1035 against a mechanical opponent. 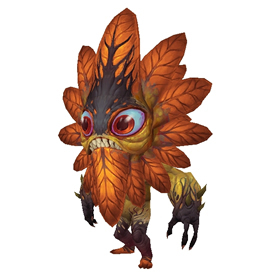 IMO, this isn't a great PVP pet, unlike its cousin, the S/S Nightshade Sproutling. Any way you consider the pet, there's a limitation of one kind or another. EG: Lash is a much better move than Club, BUT must be fast. Sons is not a great move. Any of HH, PP or SS would be...'workable', if specced and played in a certain way, in each case. Other non balance breeds don't assist very much , except HP in a tanking role. Those 4.